HDPE StopLog multi panel flood barrier system, is a reliable and an adaptable protection from high water conditions. Modular HDPE log stops provide the versatility of flood protection at the maximum height of waters expected. StopLog flood barriers provide one of the fastest placement barrier systems against flooding. Stoplogs are modular water control systems that control water levels by adding or removing stoplogs in an opening frame system. Each log is horizontally placed into a channel between two side structures to provide height barriers against rising waters. Each StopLog 12-inch HDPE Panel provides a vertical flood water protection of 12 inches. The panels stack one on top of the other until the desired protection height is obtained. 6 panels stacked atop each other make a 6-foot-high flood wall. Each flood wall section can span a width of between six to twelve feet, dependent on the protection height. Max widths are calculated related to height requirements. End channels attach directly to the structure and the log sections fit in the end vertical channel. Depending on the width sections may joined together between support channels. Stabilizing brace functions form part of wider width requirements. StopLogs temporarily block flow through a spillway during routine maintenance or for longer periods of time for example during flood condition, they act as flood barriers against rising water levels. Stoplogs regulate / block the up stream water level between a minimum level and a maximum level. Stop logs are used for water level control in open channels. Logs are blocking gates inserted in grooves placed on a channel wall. Typical nominal height of a stop log is in specific increments, i.e., the log can be 6, 12, 18 inches wide and various lengths. HDPE stop logs have rubber type seals on each end to seal at the wall and across the bottom of the log to seal at the sill or against the next log. HDPE stop logs are equipped with lifting lugs for use with a lifting beam. 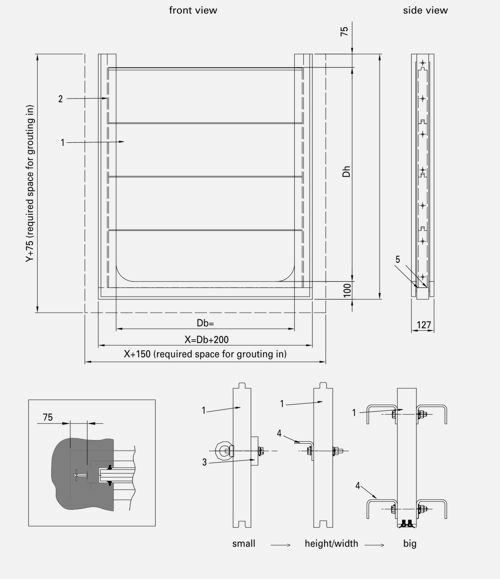 The blocking log gates are a modular log handling device for underwater retrieval of the log. Flood barriers and other functions.